Wood Forget-me-not (Myosotis sylvatica), this delicate, tiny and humble wildflower, spread over a large area, is an unforgettable sight. Do you have a shady, part shady, wet spot in your garden where not much grows? A woodland garden, bog garden or ponds maybe, where you don't have much time to invest in plant care? If yes, the Wood Forget-me-not is happy to enchant you with a sky-blue ground cover, growing on its own, without ever asking anything in exchange. Of loveliest and serenest blue. This little poem says it all. I was not able to find out the author's name to thank for the worlds. Look at this picture, aren't they beautiful? 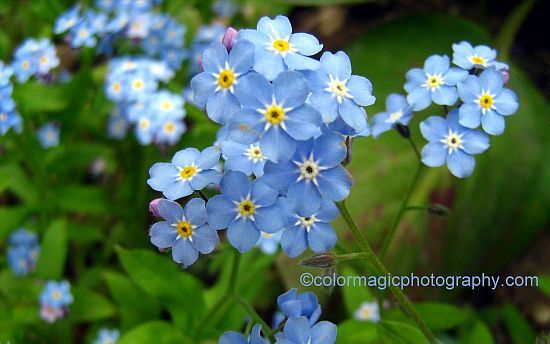 There is though one thing you can't do with this flower: you can't forget a Forget-me-not! 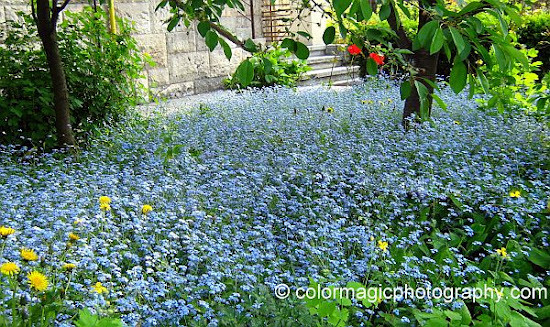 There are many species of forget-me-not, check out some of them. Incredibly beautiful, bright blue as far as you can see. Forget-me we call the flower here in Norway.